Tomb discovered in the valley of el-Assasif. A painted reconstruction of a tomb from the valley of el-Assasif, on the West Bank of Thebes, a center for funerary monuments. The Egyptians never ceased to surround their dead in their underground temples with objects which had been dear to them during their life. Native of the land of Punt (17th Dynasty, ca. 1622-1540 B.C.) Dressed in a simple loin-cloth and armed with a stick, an Asiatic figure with male features is driving a donkey laden with full panniers. The figure is a native of the land of Punt, a region from where the ancient Egyptians imported precious raw materials like gold, ebony, and ivory. The picture was sculpted and painted on the external wall of the temple at el-Assasif, on the West Bank of Thebes. During the 19th century, many travellers to Egypt were so seduced by its marvels and monuments that they recorded all that they saw in careful notes, diaries, and drawings. With their rapturous travel accounts, these voyagers became the earliest, and some of the most influential, Egyptologists, long before this discipline was even properly established. Achille-Constant-Théodore-Émile Prisse d’Avennes (1807–1879) was one such traveller. A passionate observer, Prisse did not limit his interests to ancient Egypt but instead studied Egyptian art and architecture right through to the Islamic period. Often under the Egyptian pseudonym of Edris Effendi, he first embarked on his explorations in 1836, documenting sites throughout the Nile Valley and across numerous ancient Egyptian eras. Prisse’s first publication of notes, drawings and squeezes (a kind of frottage) came in the form of Les Monuments égyptiens, a modest collection of 51 plates, but one met with considerable acclaim in both popular and intellectual circles. Encouraged by his success, Prisse returned to Egypt in the late 1850s to expand his work. His subsequent, vast oeuvres, L’Histoire de l’art égyptien and L’Art arabe, offer a truly complete survey of Egyptian art. 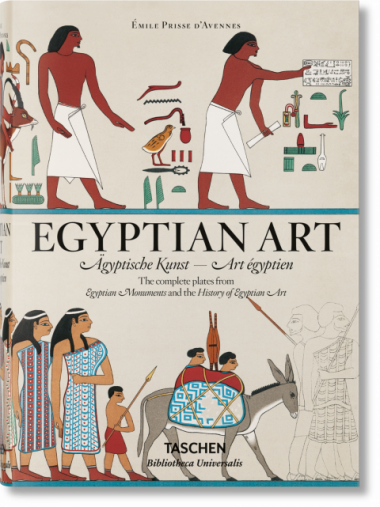 Even when compared to the products of the great state-sponsored expeditions to Egypt of this period, this compendium remains the largest, single-handed illustrated record of Egyptian art in existence. In its accuracy and its sensitivity, Prisse’s work marks a real leap from that of other artists of his time. His vast project covers architecture, drawing, sculpture, painting and industrial or minor arts. The sections, plans, architectural details and surface decoration of the façade of each monument are all documented and depicted to perfection. In addition to his skill as an artist, Prisse’s work is also testimony to his historical, social and religious understanding. As sensitive and accurate as it is encyclopaedic, his vast enterprise remains invaluable and unsurpassed in the study of ancient Egypt. Prisse’s accurate and sensitive recording of Egyptian art throughout the 3,000 years of Egyptian history (and beyond) has provided us with a record and an unparalleled understanding of ancient Egyptian architecture, sculpture, painting and even industrial arts. Can you tell us how Prisse managed these vast expeditions and publications? Salima Ikram: Prisse was an unusual and ambitious man with a great sense of adventure. It was this that first led him to Egypt and then to strike out on his own explorations. Travelling by himself or with just a few others, he managed to cover a lot of ground and to document a vast number of sites, and historical eras, along his way. Prisse was aided by his knowledge of the country, its customs and its language, as well as by important local contacts, such as Dr Henry Abbott in Cairo, with whom he founded a literary group to discuss Egyptian art and history. His Egyptian persona, Edris Effendi, also provided him with greater ease of travel, and with opportunities to visit places into which Westerners would not typically gain access. What is especially interesting about Prisse’s albums from an artistic perspective? SI: Prisse’s work is clean, not overly prettified and more true to the images made by the ancient Egyptians than the output of other artists of the period who persisted in putting a Classical stamp on their representations, or painted Egypt in an overly naïve way. The particular situation whereby a single person executed all the final illustrations and oversaw the production of the publication also gives Prisse’s work a harmonious unity lacking in other compendia of the 19th century. Interestingly, Prisse’s section on architecture consists not only of images of buildings but also of ancient Egyptian depictions of buildings, particularly those found on the walls of the tombs of Amarna. Prisse’s attention to ornamental patterns is also especially valuable to Egyptian art history since he is able to trace the variation of patterns over time and geography. He evokes the idea, long-discussed among scholars, of ancient pattern books that circulated throughout Egypt and influenced the plans and decorations of monuments. What kind of influence did Prisse’s work have? SI: There is no doubt that the trends and affection for Egyptian objects and themes found throughout Europe in the latter half of the 19th century were influenced by Prisse’s publications. His catalog was particularly interesting to those who worked in design and served as a template for decorative arts. In their eye for artistic detail and variation, these rich images may also have influenced the late 19th- and early 20thcentury Arts and Crafts movement, as well as Art Nouveau.